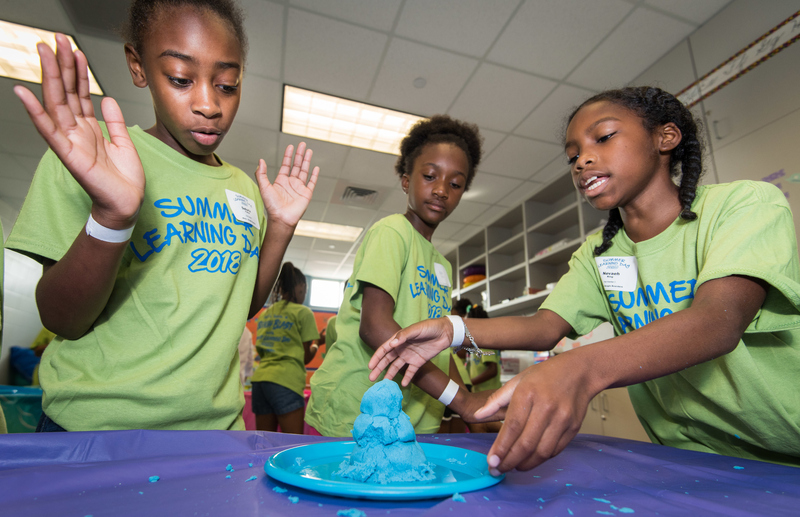 Aniyah Johnson, 8, thinks summer learning is cool because it beats staying at home. During Summer Learning Day, a national advocacy day to support keeping kids learning, safe and healthy, she measured the buoyancy in beach sands, tracked her heart rate and had fun splashing in the water. Fun stuff, she says. The Center for Afterschool, Summer and Enrichment for Kids, or CASE for Kids, provides resources, training and afterschool services for over 9,000 students in greater Harris County. CASE for Kids hosted “Let’s Have a Beach Blast with Summer Learning Day” with the Harris County Precinct 1 summer enrichment program. Approximately 125 children participated. Nutty Scientist of Houston, a CASE for Kids Select Provider who supplies fun, science education to afterschool sites, was on hand helping kids to explore properties of sand. Another activity was tracking heart rates while Zumba dancing. Kids also tried yoga to relax and tested their creativity through some art projects. “I believe summer programs are important because you get to connect to new people and have new bonds while also enjoying a safe environment,” said Christopher Mosley, 13, who attends Yes Prep Fifth Ward during the school year. “I’m learning new things this summer like teamwork and communication—things I can use later in life,” he said. Education research shows that students can lose two to three months of academic skills in the summer. Caruthers says teachers spend a lot of time reteaching and getting kids back on track because of the lapse in skills use. The National Summer Learning Association, which promotes the nationwide awareness day, says kids can gain weight twice as fast due to inactivity during the summer when they’re out of school.